Bumblebee queens visit flowers of the alpine skypilot. These large bees have a distinctive flight buzz, the bee version of a cargo plane flying from flower to flower. Indeed, three-quarters of global food crops depend on pollinators to some extent, according to the Intergovernmental Science-Policy Platform on Biodiversity and Ecosystem Services. Pollinators like bees are especially vital for fields of tomatoes, almonds and apples. In the U.S., pollinators are responsible for more than $24 billion dollars of economic activity, according to a 2014 Obama Administration report. The problem: Pollinators are disappearing. Beekeepers surveyed last year, for example, lost one-third of their colonies. A mix of weather, disease, climate change and chemicals is often fingered as the culprit. Without a reliable number of animal pollinators, farmers do not know how much pollination is actually going on in their greenhouses and fields. Kelly used to borrow honeybee colonies from his friend every spring to help pollinate his certified organic apple trees. Four years ago, though, the bees he borrowed disappeared – likely due to competition with other species. He decided then that he couldn’t rely on honeybees and shifted his focus to attracting bees native to his Missouri habitat. Farmers like Kelly would love to know exactly how active bees are in his orchard. That can help him monitor pollination, let him know if he needs to step in and pollinate by hand and maybe even help him predict how much of a harvest to expect. But native bees are wild. And even if they are buzzing around, are they actually doing their jobs? Candi Galen, a biology professor at the University of Missouri, wanted to answer that exact question. She studies beneficial partnerships between species. Candi Galen, a University of Missouri biology professor, is studying a way to help farmers identify pollination activity in their fields. While honeybees often get the spotlight, they are generally managed by individual beekeepers and commercial operations. Galen wanted to look at native bees, like bumblebees, and see if there was a way to monitor their activity, a tough task for a small team or an individual farmer. “We wanted to figure out short of cloning ourselves how we could be in many different places getting valuable data on bee populations, their abundances and the pollination they're providing for plants at the same time,” she says. Bees, of course, produce that buzzing sound as their wings beat against the air. Galen and her team set up microphones in clover patches, which have a tasty flower for native bumblebees, in central Colorado. They wanted to listen in to the buzzing bumblebees make when they are flying from flower to flower. Galen and her team recorded fields of clover for a week, then took the audio files and fed them through a computer. With a bit of number crunching, the team was able to determine the number of distinct bee’s buzzes. Galen and her team were able to break down the buzzes to identify unique frequencies of individual insects. The buzzes could tell the researchers how large a bee is and even how long its tongue is. After that, it became a simple matter of counting. 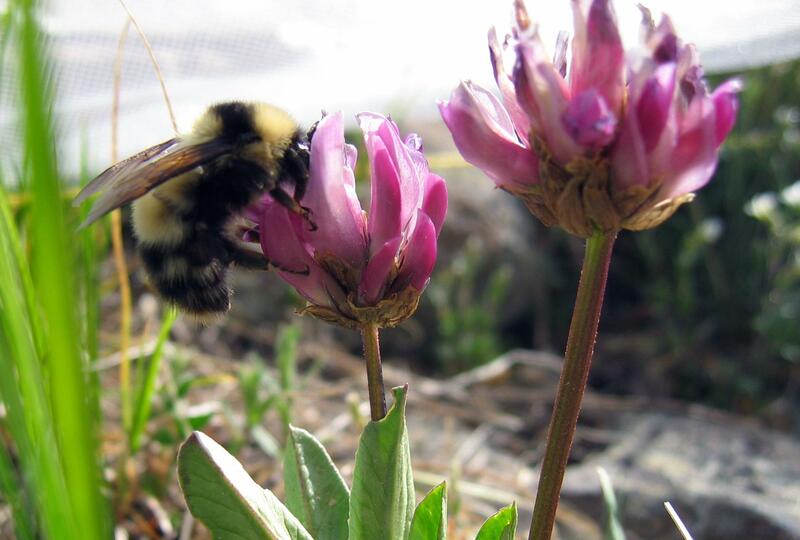 A bumblebee queen collects nectar from alpine clover. Then, the more vexing question: Were the bees actually pollinating or just passing by? In the fall, she returned to Colorado to count the seeds in the clover plants to see how successful the bees were in pollination. Turns out, pretty good. She says the patches of clovers where her team counted more buzzes during the spring had more seeds in the fall. And those with fewer buzzes had fewer seeds. While not a conclusive formula, it is good news for, say, a tomato farmer who has opened up her greenhouses to bees for pollination. “If we have microphones there, we can tell her how she’s done and whether that’s how much time she needs to leave them open in order to get that great pollination service,” Galen says. That is valuable information for farmers who are already strapped for resources, Galen says. Especially in light of a declining pollinator population. In fact, she is working on an app to help farmers start counting their own buzzes.